What does it say about me that I have more fun at middle school dances as a grown-up than I ever did as a middle schooler? Woodlawn’s 7th graders hosted a February dance last night. The theme was BRIGHT COLORS to avoid any romantic drama involving Valentine’s Day, so everyone dressed in their rainbow best. I waltzed in fashionably late in a magenta and turquoise get-up, danced with a gaggle of my 6th grade students to “Fly Like a G6” (though we sing, “now I’m feelin’ so fly / like a fruitbat,” which we feel more accurately characterizes us), and filmed all the hair-whipping that occurred when “Whip My Hair” came on. We stopped mid-dance to run outside and play freeze tag. I ditched my heels and joined the math teacher, also named Julie, as “it.” Once our feet and hands were frozen, we all filed back in for more dancing. Julie and I sang a duet of “Ice Ice Baby” at one point, showing our age. Every now and then I’d have a chaperonely duty to perform: directing cleanup, vetoing a song or two, telling the 6th graders to stop screaming. But in general, the dance was exactly what a middle school dance should be: fun and happy. Why didn’t I have this much fun when I was actually in middle school? I vividly recall my 7th grade Valentine’s dance. My teachers were apparently not as sensitive to the delicate hormonal phase we were in, so they thought it’d be a great idea to make the dance as sappy as possible. Everything was covered in red and pink, with hearts papering the walls. It looked like cupid had thrown up love and romance on every available surface of the multipurpose room where the dance was held. Not only that, but a table was set up outside the bathrooms where the PTA was selling roses and candy for the suave middle school boys who had come to the dance unprepared for their dates. Someone had asked me to this particular dance. We’ll call him Jeb, and he was not my type. I told him I would go with him as a friend because I wanted to be nice, but once I arrived at the dance, the middle school social pressure overwhelmed me. I didn’t want to be seen with Jeb, much less have to, like, dance with him and stuff. Just after walking in, I caught sight of him at the aforementioned table buying a rose for me and I booked it to the girls’ bathroom, where I hid for the majority of the night. Every now and then I’d poke my head out and watch him wandering around quizzically, looking for me in the crowd, and then I’d duck back in to hide some more. Part of me felt guilty, but the part that felt mortified won out. Jeb moved away shortly thereafter, and I felt so bad for having ditched him at the dance. Thankfully, he returned in high school and I got the opportunity to apologize. I chalk the whole experience up to middle schoolitis, the inflammation of your social nerve. For some reason when you’re a middle schooler, it matters so much what others are thinking about you. You don’t want to dance, because what if people think you dance funny? You don’t want to hang out with certain people, because what if people think you’re like them? You don’t want to wear certain clothes, because what if they send the message that you’re uncool? Phew, I’m so glad that’s over. And so glad that I, unlike a lot of grown-ups, have a second chance at the middle school dance! Call it one of the perks of being a teacher. Anyway, after all that fun last night, I didn’t have much time for baking. I knew I wanted to make something sweet and Valentinesy, but it also needed to be quick. 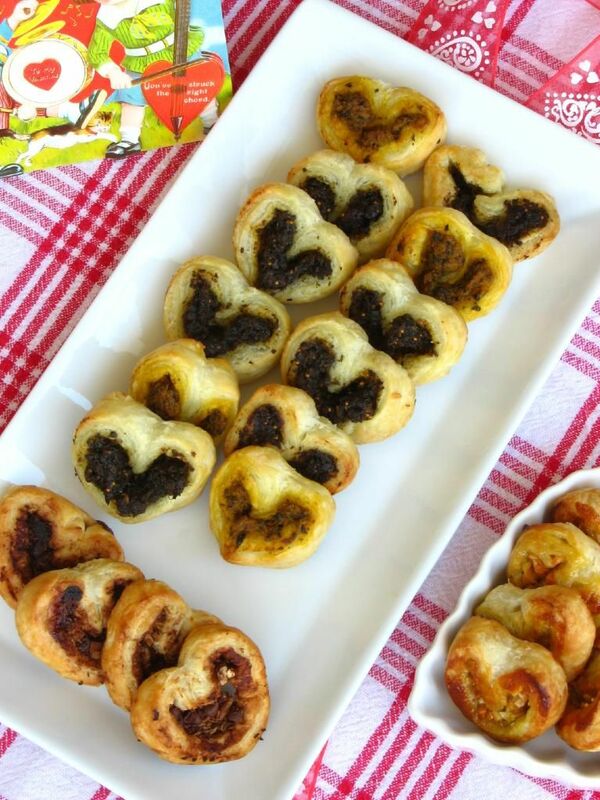 Voila: easy heart-shaped palmiers that can be sweet or savory depending on what you spread in them. Pestos With Panache by Lauren sent me two pesto flavors to review, Fig & Gorgonzola and Pumpkin Chipotle, so I decided to make two varieties of pesto palmiers. To satisfy my sweet tooth (who’m I kidding? it’s insatiable), I also made Fig Jam & Almond Palmiers and Chocolate, Pecan, & Coconut Palmiers. I love that palmiers are so customizable that you can create a variety of them at once (the method below will inspire you to get creative! 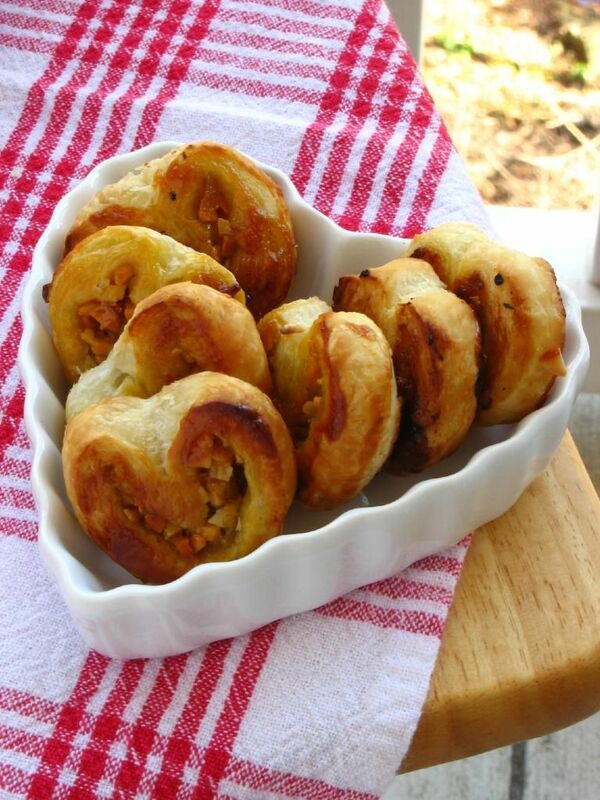 ), but what I love even more is that you can whip up a batch of these cuties in 20 minutes. 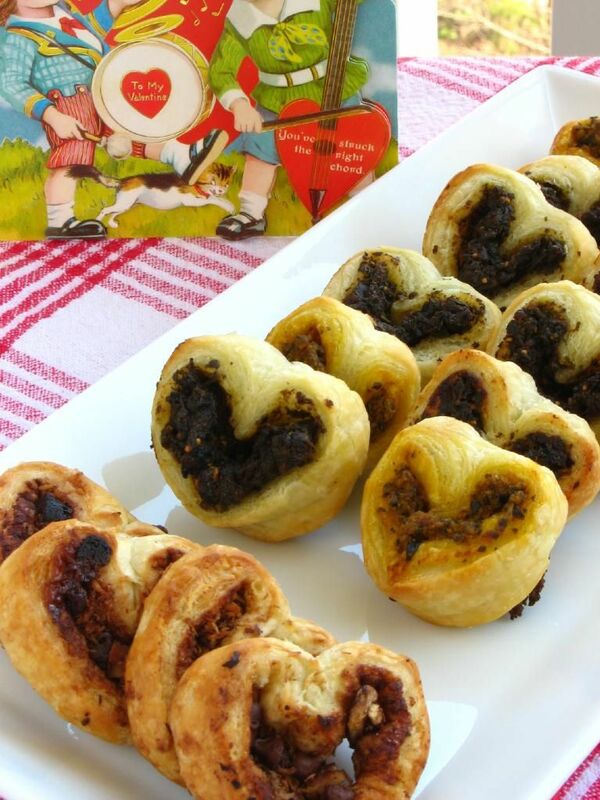 Perfect for a last-minute addition to your Valentine’s meal! 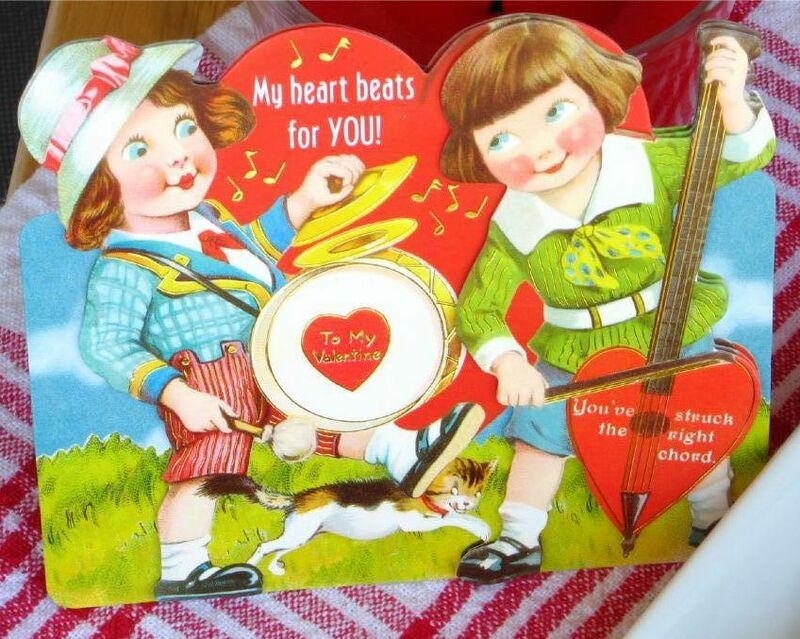 Speaking of Valentines — the Valentine’s Fairy heard my lamentations about not getting any valentines as an adult, so I got this in the mail from my Sunday school teacher, Joyce. Too sweet! Regarding the pesto, Pestos With Panache by Lauren has all-natural, preservative free products. The pestos keep well in the freezer for up to two years, and the company boasts a number of zany, creative flavors. I wasn’t wild about the Pumpkin Chipotle Pesto; it combined mild pumpkin with some heat, and it seemed like it would work better in a recipe with bolder flavors to complement it. The Fig & Gorgonzola Pesto, though, was deep and delicious, and I can’t wait to try some of the other fruity flavors. I can imagine lots of creative uses for them, including (of course) palmiers! 1. Required Main Entry (your other entries won’t count unless you do this one! ): Visit Pestos With Panache by Lauren and tell me what 2 pesto flavors you’d love to try. To get up to five extra entries, do each of the following items (one entry per item). Please be sure to leave a separate comment for each item you complete, or you will not receive the entry for that item. If you already do these things, it still counts (just leave me a comment and tell me so). 2. “Like” Pestos With Panache on Facebook. 3. “Like” Willow Bird Baking on Facebook. 4. Follow Pestos With Panache on Twitter. 5. Follow Willow Bird Baking on Twitter. The contest will close at 12 noon (EST) on February 19, 2011, and the winner will be chosen via random.org. In the meantime, make some palmiers! *you can use pestos, jellies, Nutella, thicker sauces, etc. **such as cheeses, toasted nuts, chocolate chips, etc. 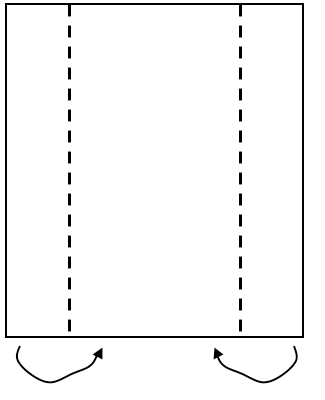 Preheat oven to 425 degrees F. Line two baking sheets with parchment paper. Roll out the puff pastry sheet on a lightly floured surface so that it’s just slightly longer, and then cut it in half horizontally with a pizza cutter. 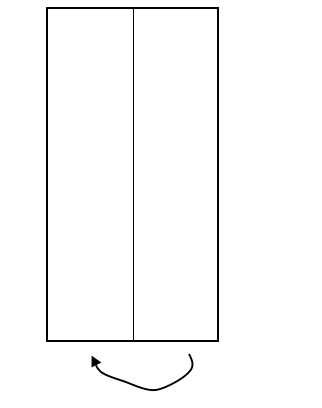 You now have two rectangles of puff pastry. Spread your pesto, jelly, or other moist spread onto the puff pastry sheets leaving about 1/4-inch border around the edges. 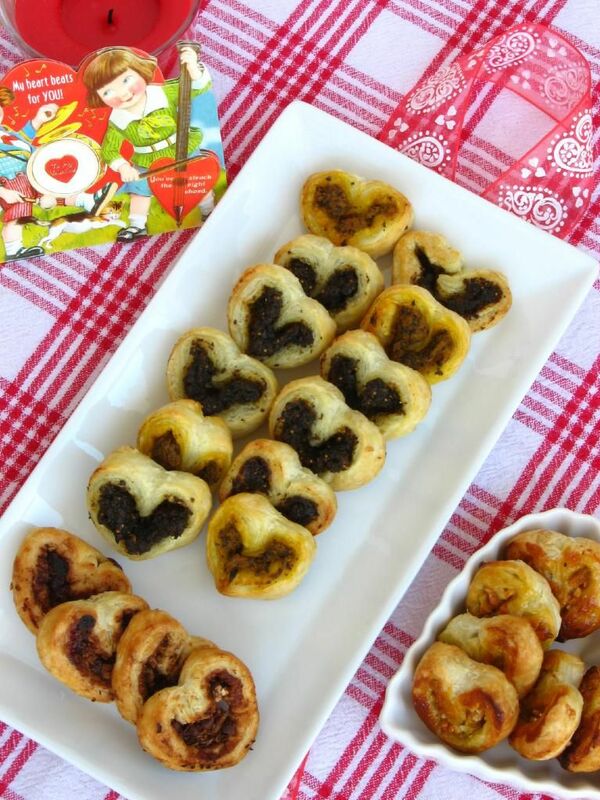 Sprinkle toppings on lightly, taking care not to overstuff and make your palmiers difficult to roll. 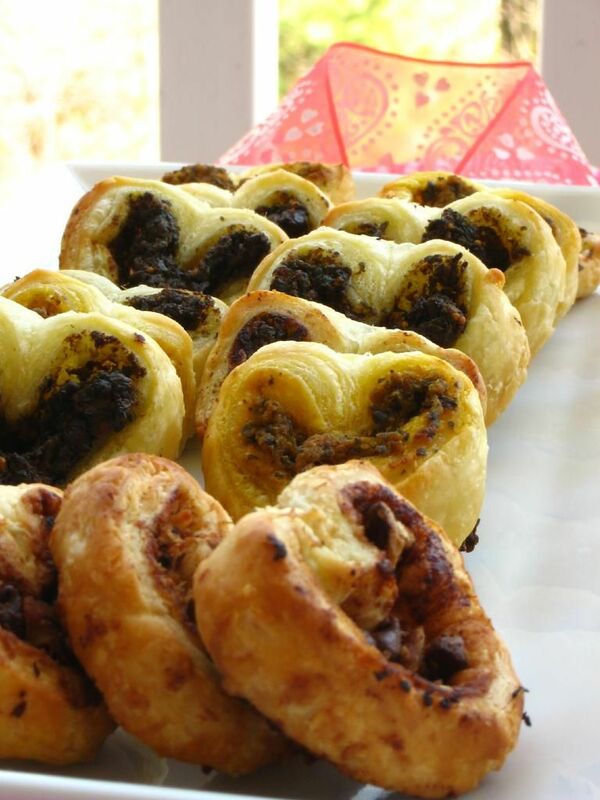 Apart from my two pesto palmiers, I made palmiers spread with fig jam and sprinkled with toasted almonds, and palmiers sprinkled with sugar, cocoa powder, toasted pecans, mini chocolate chips, and toasted coconut. The sky’s the limit in terms of the combinations you can create. 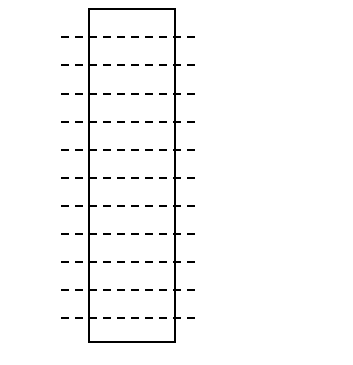 Set each slice on one of the prepared baking sheets with one of the cut sides up. If the knife smooshed them a little, prod them back into shape. Bake at 425 degrees F for 8 minutes before turning the temperature down to 400 degrees F and gently flipping each palmier. Bake for 4-5 minutes extra. Remove the palmiers from the oven and transfer them to a cooling rack. Serve slightly warm. Note: Pestos With Panache by Lauren provided me with 2 pesto flavors to review at no cost to me and offered to sponsor this giveaway. I’m committed to giving you my honest opinion about any product mentioned on Willow Bird Baking. I LOVE pesto! After much deliberation I would love to try the Succulent Strawberry Pesto (strawberry and basil are one of my favorite combos!) and the Fig and Gorganzola. Yum! I “like” (well love really!) Willow Bird Baking on Facebook! I “like” Pestos with Panache on FB. Following Willow Bird Baking on Twitter! Prosciutto and Smoked Almond & Decadent Dark Chocolate and Ancho Chile…yum. Following Pestos with Panache on Twitter! I ‘Like’ Willow Bird Baking on Facebook. I like Pestos with Panache on Facebook. Such a fun post. I definitely have more fun now too. The PROSCIUTTO & SMOKED ALMOND PESTO sounds like a must try. I’d like to try fig & gorganzola and blueberry! 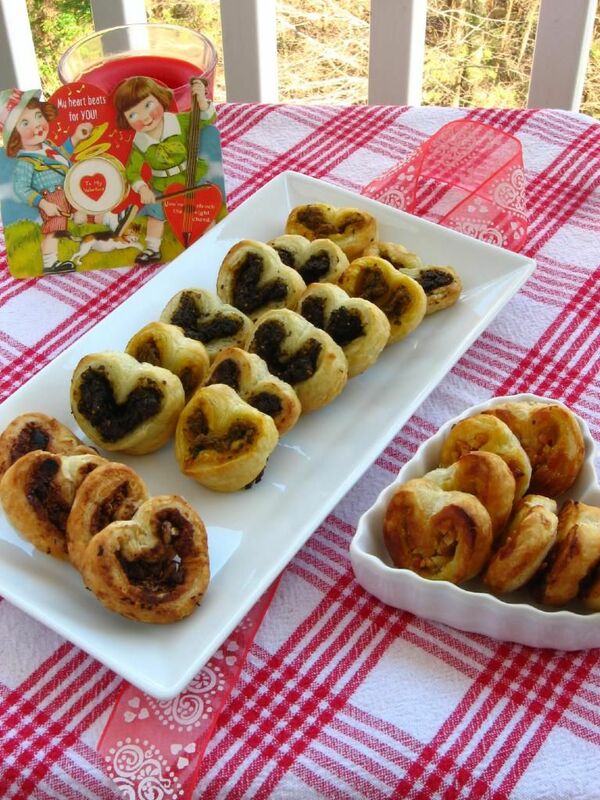 I love the ideas of savory palmiers. I know it’s gauche to toot your own horn in comments…but I recently posted a date-almond pesto one. Julie your middle-school palmier is as delicious as your recipe. Love the middle school story! Oh middle school, what awkward years! Yummy yummy. The bangin’ blueberry and the fabulous fig and gorgonzola pestos sound soooo good. Oh I want the fig & gorgonzola and the prosciutto & smoked almond! Yum!! I now “like” pestos with panache on FB. I already “like” WBB on FB. I now follow pestos with panache on twitter. I already follow WBB on twitter. I’m @mannadonn. Forgot to say that before but I know you know who I am! LOL!! Aaaaaannnnnnndddddd…I just tweeted about the giveaway. Now that I have completed all required steps, I now give you permission to pick me! The palmiers look beautiful! I am so happy you get to relive middle school dances and actually have fun at them. My experiences were more like your second story… always mortifying! I don’t ever wish to return to middle school as a middle schooler. I’d definitely like to try the fig & gorgonzola, and the strawberry sounds really interesting too! I adore Pestos with Panache! I’ve tried the fig and gorgonzola and the pumpking chipotle…I’d really like to try the strawberry and blueberry flavors! I think it’s QUITE normal to like middle school dances more as an adult than as a child. No one likes them when they’re actually going through them. But hindsight – it’s 20/20. These palmiers look delicious! Gotta love pesto in any way, shape or form. I would love to try PWP’s Succulent Strawberry and Decadent Dark Chocolate and Ancho Chile! YUM! I like Pestos with Panache on FB! I follow pestos with panache on twitter!! I liked Willow Bird on Facebook. I liked Pestos on Facebook. Fabulous Fig + Gorgonzola and Succulent Strawberry pestos! Following Willow bird Baking on Twitter. Like Pestos with Panache on Facebook. I think they all look great, but especially the fig + gorgonzola and dark chocolate + ancho chili! I would like to try the dark chocolate and ancho chili as well as the fig and gorgonzola. I would love to try the banging blueberry and pumpkin chipotle pestos. I like pestos with panache on facebook!! I like willow bird on facebook!! the blueberry and the strawberry. OMG- that was my middle school experience to a T- except that I never got asked anywhere, or given anything. Thank God teachers now plan parties where kids can just be kids and dance around and have FUN without the pressure of romance. Good for you all! As for the Pesto- definitely the fig/gorgonzola, and perhaps the prosciutto/almond or the strawberry…hard to decide! The palmiers look lovely. One of these days I’ll develop GF puff pastry! Happy Valentine’s! would love to try the fig & gorgonzola pesto as well as the prosciutto & smoked almond…though really i’m intrigued by them all! I would want to try the Dark Chocolate and Blueberry pestos. Yum! I wish our local school district had dances in middle school, my daughter is missing out on that whole experience. Fig and Gorgonzola, and Pumpkin Chipotle sound irresistible! The Prosciutto & Almond sounds delish! Really intrigued by the Fig & Gorgonzola, too. What a great giveaway! I love blueberries and would love to try the Bangin’ Blueberry Pesto and the Decadent Dark Chocolate and Ancho Chile Pesto. I love chocolate! They all sound GREAT! I follow Willow Bird Baking on Facebook! What a great blog! We didn’t have as much fun in 7th grade because we took ourselves WAY too seriously. Glad you could let loose and have fun! Your palmiers are perfect for Valentine’s Day and you’re so right about them being customizable. You could eat them for an appetizer and dessert. I’m not sure what I enjoyed more, whipping some middle schoolers at Freeze Tag or belting out, “Ice, Ice, Baby!” I really love teaching middle school!! LOL, Julie, you rocked at freeze tag! Nice strategizing!